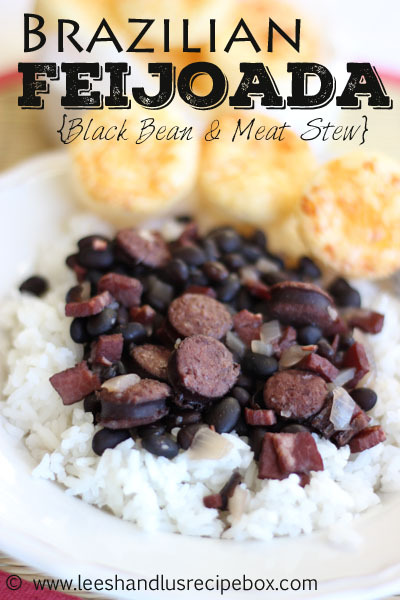 Feijoada (pronounced fezsh-wah-da) is a stew of beans and meat that is served in a Brazilian cuisine. This particular recipe comes some some of our friends, Danny & Marie. Danny is from Brazil and kindly shared this recipe with us. We were privileged to try it made by his wife, and now we're hooked! Often times when I ask Steven what he'd like on the menu, this dish is one he'll request. It's amazing to me what flavor this dish has, the ingredient list isn't too complex, and the flavor is amazing. Cooked in a crock-pot, this dish is one of those easy, throw together meals that will please any crowd or company! I am no professed Brazilian cook, but this Feijoada and Pão de Queijo (a Brazilian cheese puff bread) are two dishes that have been incorporated into our family menu that will stay forever! I will be posting hot to make Pão de Queijo in a few weeks, so stay tuned! If you haven't tried Brazilian food, this is a great recipe to start with! And in the words of Danny, "Enjoy this manna from heaven (Brazil)!!!" Rinse and sort beans. Soak beans in water, covering beans by 1-2 inches, overnight in 6 quart crock-pot. In the morning mix everything except the sausage, into the crock pot with water enough to cover ingredients by 2-3 inches. Cook on low for 4-5 hrs, adding water if needed. Slice sausage and to crock-pot, and cook for another 4-5 hrs. The longer it cooks, the softer and tastier it will be. It's fun to see how my food photography changes along the way.